EXETER, Devon -- The recent returns of Atlantic salmon in the Thames are more likely to be a result of fish straying from nearby rivers rather than a consequence of expensive restocking efforts, according to new research by the University of Exeter. A team of University of Exeter bio-scientists, in collaboration with the Environment Agency, Westcountry Rivers Trust and Oviedo University, Spain, have been collecting genetic data from returning fish, which suggests that habitat restoration was more effective than re-introductions. The findings will be published in the journal 'Biological Conservation'. Lessons from the study could be applied to other rivers across the UK according to the co-author of the paper Dr Jamie Stevens, Associate Professor of Molecular Systematics at the University of Exeter. Dr Stevens says: "Traditionally, people - such as river owners and anglers - have wanted big fish swimming up their rivers. The easiest way to ensure this quickly has been to restock those rivers with exogenous fish (from outside the river system)." He added: "In the southern parts of Britain, this has normally been achieved by taking fish from some of the big Scottish rivers, bringing them down and dumping them in, rather than making improvements to the riparian [river] habitat." In previous research into Atlantic salmon populations, Dr Stevens and his team worked with researchers from the University of Oviedo in northern Spain. They found that stable populations of salmon in the region developed genetic profiles that became definitive to a particular river system. Some of the unique characteristics appear to have included local adaptations to the river system's water chemistry, temperature and run-time from sea to spawning ground. "Almost certainly, most fish come with a vast amount of local adaptations which we are really only beginning to scratch the surface of", Dr Stevens suggests. "So, as soon as you move a fish into a river that is not its native one, it's almost certainly not as fit." Evidence from Pacific restocking programmes showed that once restocking projects had run their course, the numbers dropped off quite quickly and the fish that did remain had 'strayed' from nearby rivers. They were not fish that had been introduced from distant hatcheries. Dr Stevens explained, "In a sense, this is what we believe we are seeing in the Thames study. Those fish that were put in the river were Scottish and Irish hatchery fish, and they were probably not suitable for an English chalk stream environment." Historically, England's longest river had a 'significant' salmon population according to the research and is mentioned as far back as the Magna Carta (1215). Also, a substantial fishery existed on the River Thames until the early 19th century. The industrial revolution and urbanisation of London led to increased levels of pollution in the river and the last record of a Thames salmon was made in 1833. Since the late 1970s, there have been a number of attempts to re-introduce the species at a considerable cost. A 2001 paper estimated that �3m had been spent on efforts to establish a population in the Thames. Dr Stevens explained: "Our research shows that if your yardstick for showing recovery is the presence of Atlantic salmon in a river, then the best way to ensure that is to make sure that the environment is right, rather than just dumping in a lot of exogenous fish. 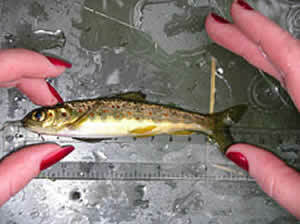 The presence of salmon in a river is important because the fish act as an 'indicator species'. "If you have healthy fish running to sea, and then you have a proportion of those coming back as healthy adults that are ready to spawn and mate, you know that things are working well within that river. "We then know that we have good gravels, good oxygenation within the water, a good range of food sources, clean water, good river flow and good navigability. It is about getting the river system right then the fish will do the rest", he said. "Although salmon are good at homing, the research shows that they are not perfect and a percentage will stray. This is good news, because straying means that the species as a whole has the opportunity to explore new avenues when they become available."